Features: 1. This plastic welding torch own the features of high strength welding, effectual sealing, fast speed, high quality, easy-operation. 2. The welding torch is made up of Nozzle, torch cover, torch core, mica set, fan blade, large motor, diode, handle, etc..
3. Thermoplastics has good resistant to corrosion in acid, alkali, and salt, good forming nature, easy to process and use. 4. The torch has electric insulating property, when add 1500V 50HZ power and torch core, electric motor and torch cover have no breakdown situation. 5. 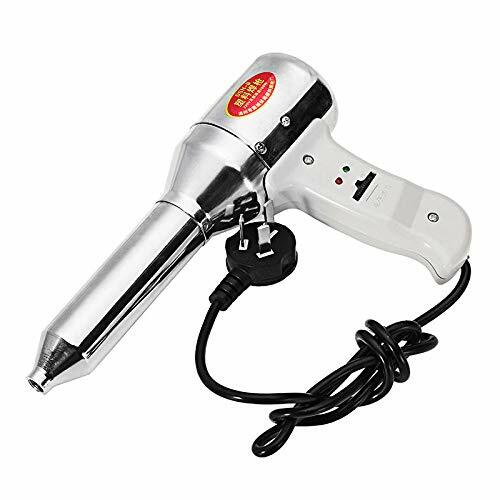 When the working temperature reach at 20℃, and the air torch can continue to work 4 hours, and the temperature of the handle will no over 30℃. 6. Widely use to all kinds of plastic welding industry, use to on the spot welding of types of plastic plates like PVC/PE/PP/PVDF, pipeline, membrane sheet ect, also fit for dedusting of instruments, meters, and drying electric machine etc..
7. for welding of plastic, like plating bath, chemical store tank, plastics pipeline. Electrical Soldering Tools Solder Irons - 2. The welding torch is made up of Nozzle, torch cover, torch core, mica set, fan blade, large motor, diode, handle, etc..